The PRO 1 SFI 3.2A/1 single layer lightweight pants gives you that distinct winning look without breaking the bank. 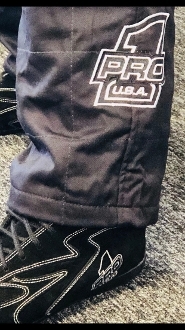 The pants are constructed of lightweight FRC materials.The pants feature Nascar style cuffs,handy front pockets, snap/velcro front, upgraded zipper. The pants meets or exceeds SFI 3.2A/1 specs. Available in only our Murdered out Black. Please see sizing chart below. NOTE: Our pants are a more fitted pant from our previous race pants.